TOLLESBURY SPRING USED BOAT SHOW Sat & Sun 27/28 APRIL 10am to 4pm! 1987, Freedom 35, SUPERB OFFSHORE CRUISER with recent conversion to BERMUDAN ketch rig with twin unstayed masts, recent sails and zip bag covers, BOW THRUSTER, 2017 Ivory Sprayhood with "Strata Glass" screen, 6 berths and well equipped including RADAR. Built in 1987. GRP construction with white topsides and superstructure, long keel with transom hung rudder attached to base of keel, hull epoxy coated below the waterline from new, encapsulated lead keel. Twin unstayed masts converted to Bermudan rig in 2011/12. Aft cockpit with wheel steering and 6 berth internal layout with approx 6ft standing headroom. 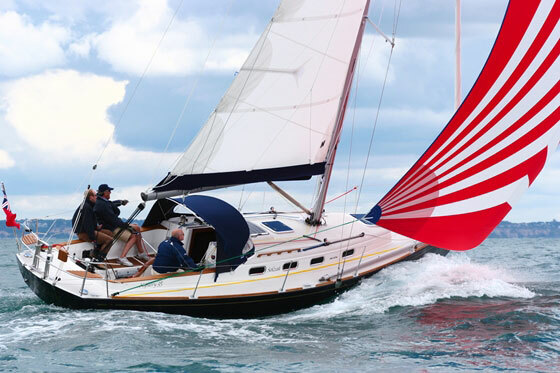 Designed by Garry Hoyt and built by Freedom Yachts, Falmouth. 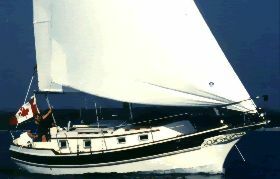 Twin unstayed aluminium masts converted to Bermudan rig by Fox’s Boatyard in 2011/12 including fitting tracks to masts, new booms, new Jeckells fully battened mainsail with 3 reefs and new Jeckells fully battened mizzen with one reef. 2 Stakpak sail covers with lazyjacks. Harken captive ball bearing cars. All lines led aft to cockpit. Volvo 2003 3 cylinder 28HP inboard diesel. New shaft seal and engine mounts in 2009/10. Shaft drive to 4 blade self-feathering stainless steel propeller (2015). 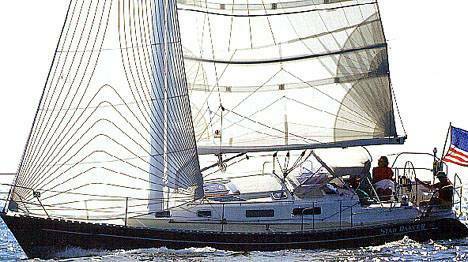 Fuel consumption is around ¼ to ½ a gallon per hour at a cruising speed of about 6 knots. New larger alternator recently fitted charges 2 x 12 volt domestic batteries, one 12 volt dedicated engine start battery in parallel with one 12 volt bowthruster battery. TWC battery management. Vetus Bowthruster with controls at wheel. Stainless steel pushpit, pulpit, stanchions and guardwires (with 2 gates), fore-deck locker, Ivory sprayhood (new 2017) by Dolphin Covers "Drop Top" design with "Strata Glass" screen, Ivory dodgers (new 2017) with name in blue, stainless steel boarding ladder on transom, Barlow 24 self tailing single winch in cockpit, yacht legs, plough main anchor with 50m chain, manual anchor windlass, various mooring warps and fenders. Chart Table with swing-out seat, Plastimo Binnacle compass, Raymarine ST60 tri data echo sounder and log, Raymarine ST60 multi, Raymarine tri data repeater at chart table, Standard Horizon DSC VHF with GPS (new 2017), Stowe wind instruments, FM/AM radio, Raymarine ST4000+ autopilot, Raymarine SL72 pathfinder radar at chart table, Clipper Navtex at chart table, Raystar 120 GPS, clock and barometer, navigation lights. Liferaft, horseshoe lifebuoy, Oscar life sling, various fire extinguishers, fire blanket, EPIRB, bilge pump. Her galley has a Techimpex Mastergrill gas cooker (new 2015) with 2 burners, oven and grill, 3 gas bottles, ice box with Super Cool refrigeration unit. Pressurised hot and cold water to the sink is from 2 x 20g water tanks. Hot water is via engine calorifier. Her separate heads compartment has a Jabsco marine toilet, washbasin and shower with hot and cold water supply. Blue/grey fabric upholstery with a teak and holly cabin floor. Headlining professionally partially replaced in the main saloon and aft cabin (2016/7). There are 6 berths including 2 “V” berths with in-fill in the separate forward cabin, 2 larger hanging lockers, 2 single settee berths in her separate aft cabin and her saloon table converts to a double berth. "Merlin" was purchased by her present owner in 2014. 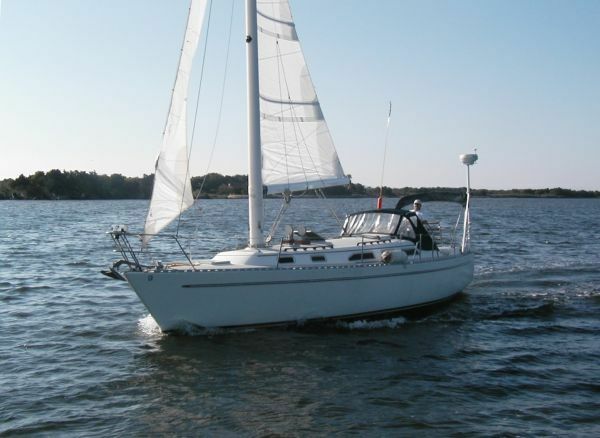 Her previous owner spent a great deal of time and money on improving the rig, changing the “wishbone” rig to a Bermudan ketch with twin sails, each having lazyjacks and zip bag covers. The boat is now very easily sailed with all lines led aft to the cockpit. Her present owner has invested in a top class sprayhood with screen, spray dodgers, new cooker, DSC VHF and self feathering propeller. Her interior is particularly comfortable having 6 berths in 2 cabins plus saloon with good standing headroom and a good quality of fit out by Freedom Yachts. 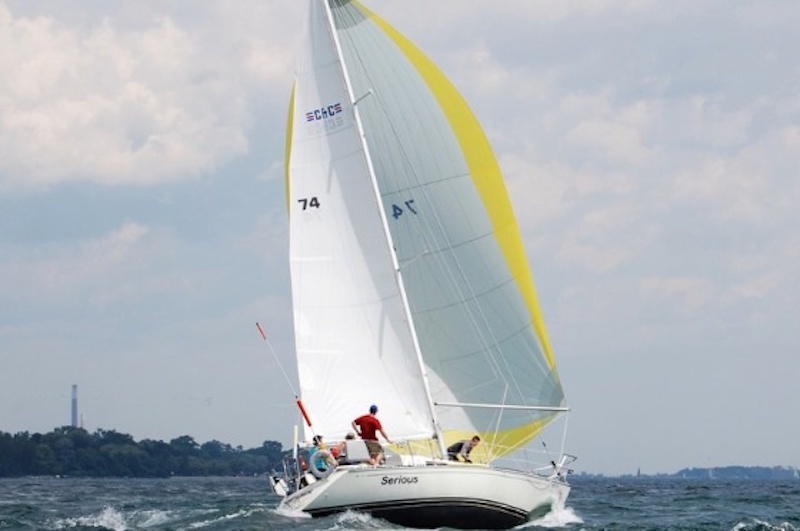 These boats are renowned for their cruising capabilities and their seaworthy design, she has a lead encapsulated long ballast keel, also ideal for the East Coast. She currently lies afloat in Tollesbury Marina.